Freshly updated with current prices, March 2016! Not long ago I gave one of my old cameras to a teenager I know who has a budding interest in photography. 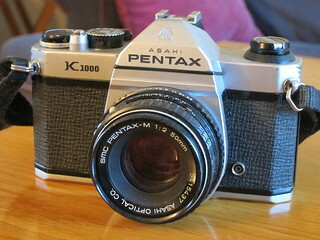 I had three Pentax K1000s and three delightful SMC Pentax M f/2 50mm lenses; he now has one of each. I hope he enjoys his new old camera! But I doubt he can appreciate that film photography has never been less expensive. Not that it’s less expensive than digital photography. My everyday camera is digital – a wonderful Canon PowerShot S95. I take it on every road trip, get it out for family events, and sometimes shoot it just for fun. My S95 cost $400 and I bought a spare battery for $40. I bought a $5 SD card to store images, which I reuse after transferring images to my computer. For that initial outlay of $445, I can take great quantities of photos indefinitely. 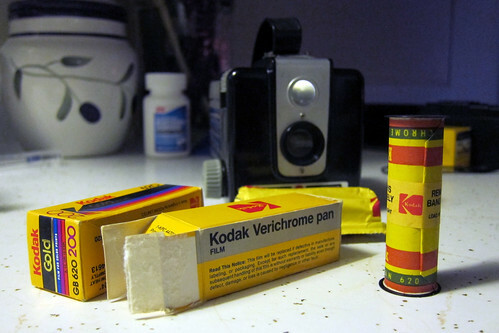 Of course, film photography has ongoing costs for film and processing. I buy 35mm Fujicolor 200 for about $2.50 a roll. The camera store downtown will process and scan it for about $8.50. If I shoot 35mm black and white film, or if I go for good old medium-format 120 film, either is available for as little as $4 per roll. But the camera store can’t process those films, so I mail them to Old School Photo Lab, which charges $16, including shipping both ways. So my total cost per roll falls between $11 and $18.50. In 2015 I shot 45 rolls of film. If I use $15 as a rough mean cost, I spent $675 last year. You can buy a nice DSLR for that money! When I take inflation into account, the differences become stark. I used the inflation calculator at the Bureau of Labor Statistics for these calculations. In 1980, shooting a $3 126 cartridge and getting $4 Clark Color Labs processing is equivalent to spending almost $20 today. If I splurged on medium-format 620 film at $5 and Hook’s processing for $7, I spent the equivalent of an astonishing $34.50 today! In reverse, my $11 Fujicolor 200/camera-store processing combo is only about $4 in 1980 dollars! And a $20 film/processing order through Old School Photo Lab is only about $7 in 1980 dollars. If film and processing had been as inexpensive when I was a boy as it is now, I would have taken a lot more pictures! starter camera. Read about it! When I was 19 or 20 my folks came back from a trip to the Caribbean with the gift of an impressive camera and a couple of lenses for it. I had it for about ten years and if I shot two dozen rolls of film with it, I’d be surprised. The best use it ever got was when a friend who worked for a small-town local paper came by to borrow it (and me as his assistant) to take pictures of a train derailment in town. Otherwise, it largely gathered dust, and the reason was what you said: everything I did with it meant reaching into my wallet. I had an artsy hankering to shoot B&W but even in the 1980s they were really sticking it to you for B&W development. So I really wish they’d had the digital technology in the late 80s we had by, say, 2005 or so. I’d have a whole lot more memories and changed places recorded than I do, and mostly for that reason. One other aspect is that now you can see if the shot you just took was good nor not, and if not, you usually have the option of trying again and improving it. With film you just crossed your fingers till the prints arrived. I just don’t think there was any kind of analog equivalent to that, and I’m so happy we’re able to do that today. But I’ll grant you that film photograph has an element of art to it, at least in its methods if not necessarily its results, that’s largely been leeched out of digital. 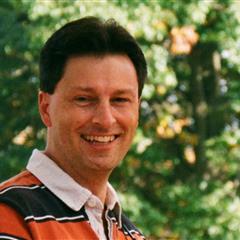 :) And more power to you and your collection, Jim. Make no mistake, to the extent I have any skill at photography it is mostly thanks to my digital cameras, because I can shoot and shoot and shoot essentially for free until I get it right. I thank my manual film SLRs and rangefinders for teaching me about light via f stops and shutter speeds, though, so there is a symbiotic relationship there. I’m planning a Spring Break trip right now, and will take a film camera along, but will still take 95% of all photos on the trip with my Canon S95 simply because there are no additional costs. I do agree that photography is less expensive today than it ever has been. I do question the idea that digital is less expensive than film. I think that since most of us already have the computers that digital requires that we don’t count that expense. And then there is the storage. With film I have my negatives and if they are reasonably cared for they will yield images for decades. With digital to have that same kind of storage I have to have a primary and backup storage. And I have to keep expanding that storage as the number of images increases. All that is an expense I don’t experience with film. Then there is the probability that at some point that I will have to convert these images so that they remain readable. I do think that it could involve some time and trouble to keep today’s digital images in a usable form for several decades. On the other hand I have slides and negatives from 40 years ago that I have never had to do anything with. I suppose I could go on and on about what I think are the hidden costs of digital. However that could get to be a pretty long comment. Just one last example is it would take a very expensive digital camera to reach the quality that you could get from an very inexpensive medium format camera. I thought about the hidden expenses — but really, in this modern age most everybody has a computer already and uses it primarily for purposes other than storing photos. I considered calling computer storage thus “essentially free” but that didn’t entirely sit well. I will say, though, that with my 500 GB backup drive I’ve yet to come remotely close to filling it with my backups, of which my photos are a small portion (as I have a large collection of video that takes up most of the backup space). And let’s not neglect the hidden cost of storing negatives and slides — while not on par with buying a computer, boxes and sleeves and such do cost, take space, and have no shared purpose. When I do digital I shoot in raw and convert the files to tiff for editing. These files are large enough that with backup I can easily fill up 500 gb in a few months. I suppose that is not typical since most people just do jpg, however it is a fair comparison to the amount of data that is in a film negative. Yeah, I just shoot jpeg. It’s plenty fine for my purposes. It’s cheaper to shoot digital. No doubt about it. On a per-image-basis, there’s no comparison. You can fill a 500gb harddrive with a boat-load of images. And a 500 gb hard drive is how much these days, $30? I just looked and you can buy a 4 terabyte harddrive for $150. I spent $200 on enough medium format rolls to give me 544 images. This doesn’t include the development which will probably double the price. Too true! I learned on an old K1000, they’re great starter cameras. To lower the cost even more, you should think about processing your own film. Maybe for 35mm it wouldn’t really be worth it for you, but for 120, it really is. After the tanks and other hardware are paid for, the cost per roll clocks in at around $.75 or less. Oh, this does require you to have a negative scanner, but it’s probably a good idea to invest in one of those anyway. Plus, processing your own is just fun. I’ve been thinking about investing in processing equipment, especially for b/w. I’m in a place right now where I can totally afford to pay someone else to process my film. However, I’d like to shoot more 120/620 but I’m impatient and hate waiting around a week for for the film to come back from the processor. On the other hand, I’m plenty busy as it is, and I can see several rolls of film backing up on me before I’d find time to process them. I have a negative scanner that does 35mm but would need to upgrade to one that does 120 too. Lots to think about in this post. I’ll just add that there’s never been a better time to buy old film cameras. I have accumulated quite a large collection over the past ten years with the average price being somewhere inside the $10-$25 range. The simple cameras in my collection didn’t cost more than that when new, but quite a few others with more sophisticated features would have originally required well over a thousand dollar investment in today’s dollars. You’re so right. I feel a special glee when I land a camera for $20 that cost $600 or $800 in inflation-adjusted dollars when new. That makes shooting film even cheaper, when you factor in the cost of the camera. For the $100 to buy even a p&s digital, you can get a nice body and a bag full of lenses, and still have some left to buy film. Some of my cameras cost $600 – $800 before inflation adjustment, That would be like $3000 in today’s money. Yet, they are tossed aside like stale bread because they are “obsolete”. The thing about film cameras is that they’ll only be truly obsolete when the film is no longer available for them. Early digital cameras, however, are absolutely obsolete. Best scanner is an Epson Photo scanner. The mid- to high- end models come with holders for those larger film sizes. Wonderful quality. Processing is not too time consuming if you use a tank that will do more than one role at a time. Freestyle in LA is one good source for film and processing material. As to buying used equipment now – amen. I bought a Canon T-70 with lens for 5.99 at Goodwill, and a speedlight for 7 bucks at the same store. Turned down a Canon AE-1 with Kiron lenses since it was 45 bucks, and then remembered that Kiron made Nikkor lenses. My take on this, as a former photography teacher, is that there will always be a place for film, just as there’s still a place for painting. More creative thought required there. And these old cameras will be treasured for a long time to come, rising in value since they’re no longer made. I would suggest a good cleaning and inspection every couple of years. Fix and Focus in San Bruno, if they’re still around, is one of the best places for this service. I hung up my K-1000 when Kodachrome got axed. But have taken it up again since Costco now does excellent processing of color print film. And I just found out that it’s still possible to get Kodachrome movie film processed. So perhaps they’ll bring 35mm Kodachrome back to life. I actually bought an Epson V600 a couple years ago, but didn’t keep it. I have space here either to have my printer out or my scanner; not both at the same time. Space is tight in my small house. The V600 was enormous, and I couldn’t figure out where I was going to store it when I wasn’t using it. When the V600 died after three days, I returned it and bought a V300, which is a ton smaller and slides neatly under my printer table (in a plastic bag) when I’m not using it. Unfortunately, and I don’t know how I missed this when I bought it, it only handles 35mm negatives. My nearby Costco no longer processes film. I used them extensively for a while, but when their minilab broke down, the home office chose not to invest in repairing it. Such apparently is the case across Indiana. I think there’s still a place for film, too, but given that it is no longer a mass-market product I predict we’ll see more films cease production for a while, until we’re left with a solid core of films that will continue to get produced for pros and hobbyists. It will be interesting to watch this unfold. Hey people ….. Looks like everyone is beating a dead horse. We all know what film and digital is all about. I would like to get in my 2 cents. I started with film when I was five years old. Digital was non existant in 1948. Ten years ago I knew about the new digital craze. I still shot film. I love my Nikon F4 and F3 for film. But then it is only 35mm. With 35, you are limited because of film size. Then about 4 years ago I got a Canon 400D and a G9. Both are OK for instant gratification. After some time I realized the image quality from these cameras were not any better than my 35mm slides. I have slides that are over 50 years old. and look as good today as the day I created them. How will your digital files look in 50 years??? First, you have to keep updating them to keep up with the everchanging digital systems. Files can currupt. Will you even have them?? Drop your backup hard drive, then what. Your lifetime of memories gone forever!!! All because you saved a few bucks with stupid digital. Computers and Photo Shop software programs are not cheap by all means. I now use a Bronica SQ with 3 additional lenses. Mamyia 645 Super Pro. A 1000s with additional lenses. Both have additional speed grips and power winders. The results from these film cameras will blow away all consumer and even some pro digital grade gear!!!!. I do my own darkroom work with my Omega color enlarger and I have film carriers from 35 mm up to 4×5. I can go on and on, but I don’t want to hear about you tearing your hearts out. Just a few more words from a guy who knows that great photos are taken not with an expensive digital camera, but with simple knowledge and understanding of how photography works. You Tube is a great place to start. Digital cameras are computers. Don’t trust your work to a computer chip. I never really trusted them. If you ever saw the movie “I Robot” you’ll understand. Submitted by Bill from ” Man In Black Photography”. I don’t about waiting for a wk for processing……But trying to find a more reasonable price….either local or mail order is fine. Try your local Costco, Jeanne. Often one hour, high quality. Color negative only. Very inexpensive. My black and white shooting is now all done with Eastman Double-X (5222) motion picture film stock, of which I purchased a 1,000-foot roll direct from Eastman. Not cheap up front, but pretty darn cheap when portioned out into rolls. Somebody I know gave me a few rolls of that stuff, via the Film Photography Project. I like it. There’s a post somewhere around here about it if you search. The cameras are cheep, I bought a Canon Rebel X, 35mm at a pawn shop for $35 a few years back, works great. Problem is getting the film developed at a reasonable cost, now that Sam`s Club, and Costco quit doing it this year. Yup. Even sending your film to a mail-order processor is cheaper than processing was in the 70s, though, adjusted for inflation. I had forgotten about Clark Color Labs until I read this. A mailer would usually be in the Sunday newspaper and it was very rare that I didn’t have a roll of color film to mail them. This was probably in the 70’s or early 80’s. I still have hundreds of photos developed and printed by Clark. I probably found Clark the same way. My only beef with their work is how their prints faded over the years! Hey, Jim. I recently went to my daughter’s college graduation from University of Michigan with a Panasonic digital point and shoot camera. I got a few good shots but I realized that most of the shots were wasted and the one-inch viewer was not that good and the low light shots and distance to the dais stuff were pretty much throwaways. Being retired, the idea of buying a good DSLR with lenses met with a solid “NO” from my bank account. Back home in New York I dug out the Canon AE-1 that I bought a few days before said daughter was born 34 years ago, got a fresh battery – finding a Radio Shack is as hard as finding cheap processing – and a roll of UltraMax 400. We shall see. It may not work at all since the camera has been in the closet for at least 10 years. But more expensive or less expensive, I love the feel of the AE-1, the magic of manual focusing and that wonderful sound the shutter makes at F:250. It’s like using a manual typewriter after using a laptop for a decade. You have to think about what you’re doing because it’s not easy to fix mistakes. Yes, those new digital cameras don’t yet hold a candle to the film cameras. My fancy Lumix is so automatic that a simple thing like manual focus is harder than setting shutter, aperture and focus on the dear old K-1000. I was a passenger in a car heading down the Halcyon hill from the Arroyo Grande Mesa, here on the California Central Coast, when a beauty shot I’ve waited for for years came into view – the Santa Lucias and Oceano Dunes and the Pacific in the background, rich agricultural fields in the foreground, and the trans-continental Amtrak train right in the center. Grabbed the Lumix – which insisted on focusing on the inside of the vehicle window. Shot missed. If only I’d had the old Pentax! I’m sorry you had such bad luck with your digital camera at such a key moment! I’ve owned two AE-1s and find them to be pretty robust, even after having been stored. The only thing I find to go wrong with them is a squealing noise from the shutter. It doesn’t affect picture quality – it’s just noisy. Good luck with yours!